Pears love Pears from Drew McKevitt on Vimeo. This is a little stop-motion movie I made a while ago. And speaking of pears loving pears, I’ve been collecting tons of pear pictures on Pinterest. 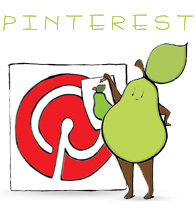 You can follow my Pinterest pear board here! Also, I’ll be at the Willingdon School Craft Fair this weekend with Angry Pear stuff. If you’re around Montreal, check it out. I think there will be some pretty amazing vendors there. Categories: Animation, pear people, Stop Motion | Tags: angry pear, craft fair, fruit, humor, Montreal, Pear, pear person, pears, pinterest, polymer pear, shopping, stop motion, Willingdon School | Permalink. ha ha … I really love this!